After a week-long absence from blogging, I'm back for the next chapter of my adventures! 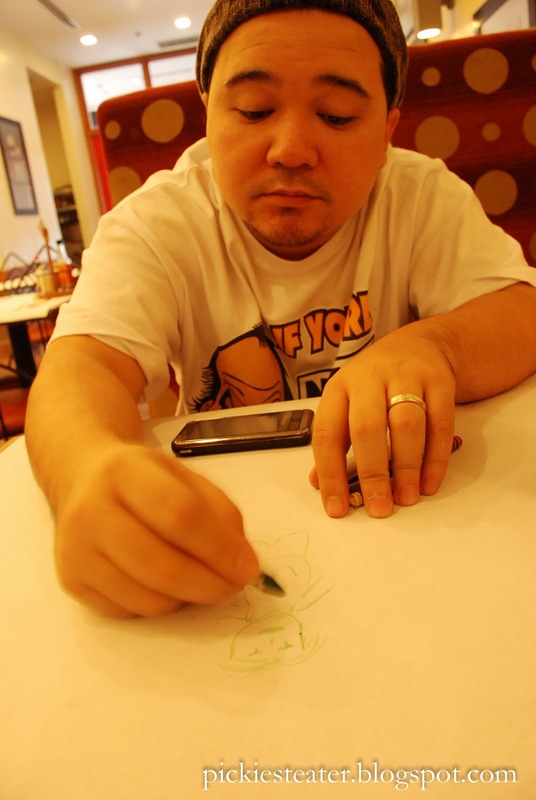 My next stop was during a trip to SM Marikina. First of all, I was surprised that the mall itself was a lot nicer than I thought it would be. But then again, it's SM, so how different could it be, right? But since one of the newer malls, the place was still lacking in restaurant choices. I already went to TOSH, and I wasn't planning on doing a post on Burger King, so the next best choice was either Burgoo or Teriyaki Boy. For some reason that I cannot understand, I chose Burgoo. A decision I would eventually regret. 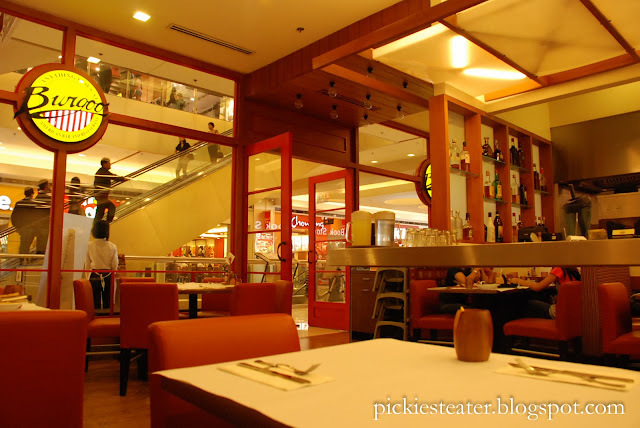 I've always seen Burgoo as something like a "Poor Man's TGI-Fridays" - except without the good food. Huge portions, a wide range of choices, but I have yet to try something there that blows my mind away. It does have a clean, comfortable atmosphere to it, and the staff go out of their way to be friendly and courteous. 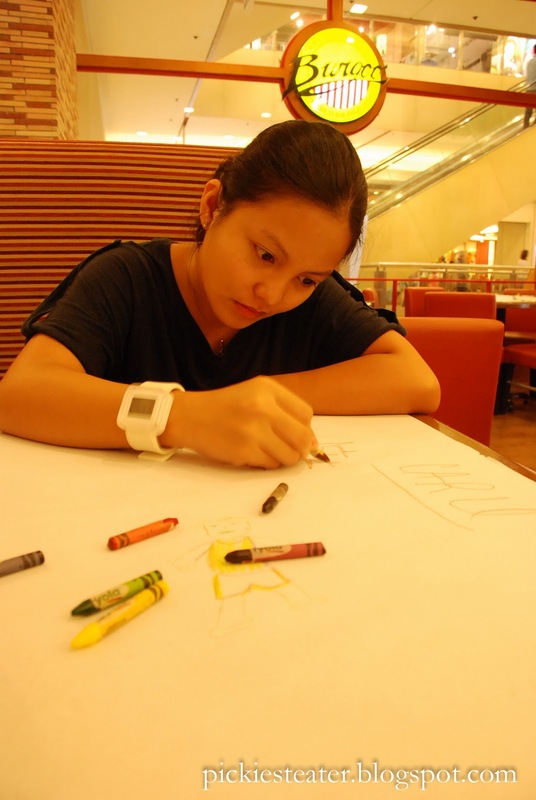 Just call me "Leonardo Da Richie"
What I really enjoyed about Burgoo were the crayons. I don't know how to draw at all, (as evidenced by the picture above) but I like the thought of being allowed to draw on the dinner table before a meal. 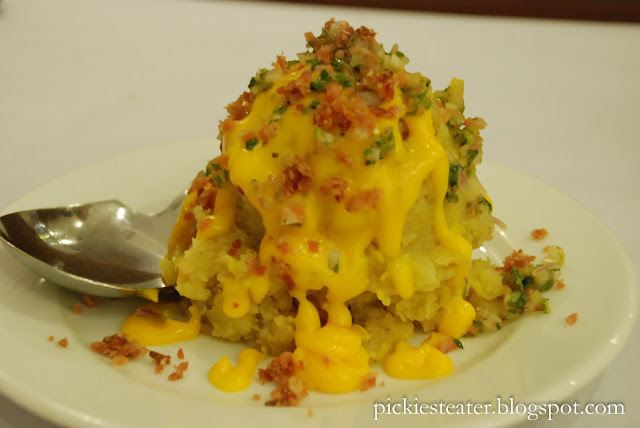 To start off the meal, I ordered the Mashed Potatoes Mexicano (P175). When I read the menu, I saw it said potatoes, with Bacon and cheddar cheese, so I didn't need to read any further. I was hoping for soft, creamy mashed potatoes that would have the smokey taste of bacon and the richness of cheddar cheese. Instead, I got lumpy Mashed Potatoes, with bacon bits so small they might as well have been bread crumbs because they made no difference in the taste. 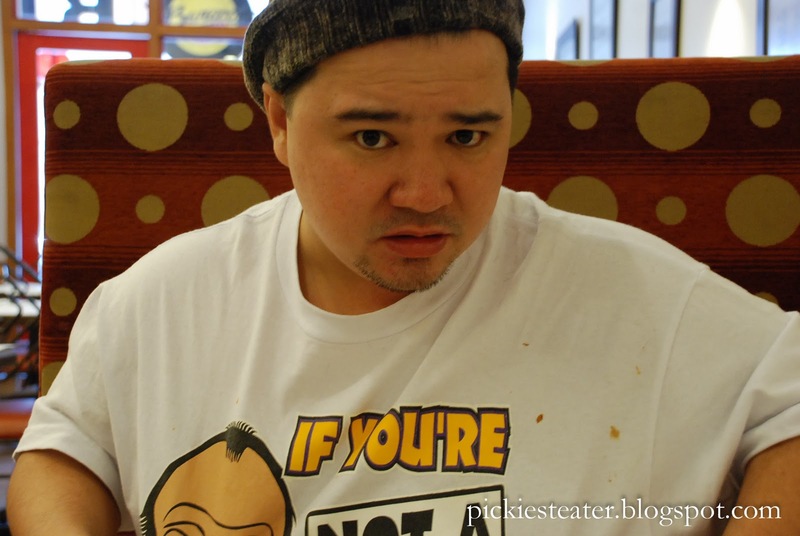 The Cheddar Cheese tasted nothing more than melted "Chiz Whiz". The lumpiness of the mash potatoes is what totally ruined it for me. It was barely mashed.. had the texture been different, the dish might not have been so bad. 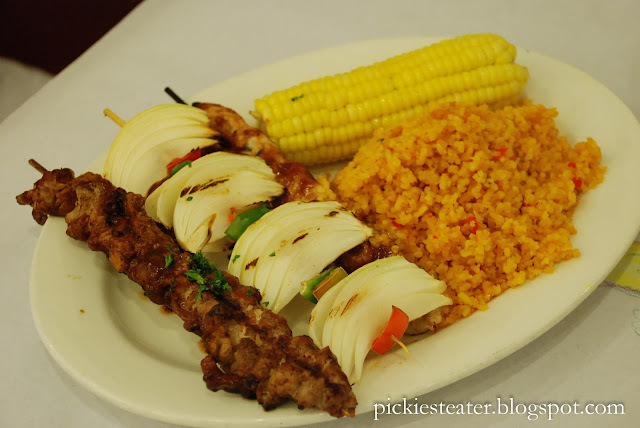 Perhaps the best thing about the The Burgoo Kebabs (P325), was the option of mixing and matching between beef and chicken, but sadly, both options were mediocre. The "Kebab" sauce was basically peanut sauce you could get at the grocery. The "grilled onions" were raw onions with the top layer singed. The Java rice was pretty decent, but the meat of both the Beef were a bit dry, and it was such a struggle to get the beef out of its stick, that I accidentally flicked the kebab sauce unto my shirt! As you could expect, Rina was not pleased. But I pleaded my innocence and blamed it on the Beef (This never would've happened at Mr. Kebab). 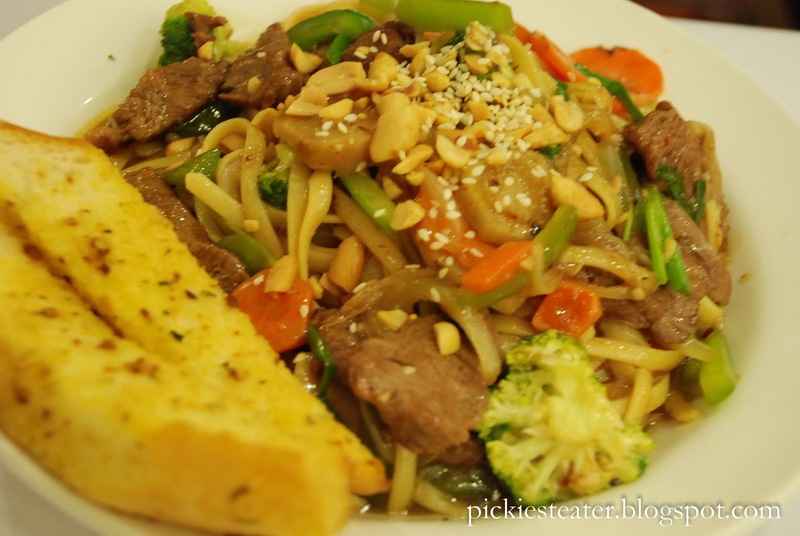 Even during my first visit to Burgoo, I was intrigued by the Szechuan Steak Linguini (P345). On paper it actually sounded pretty good. In real life, it tasted like paper. Actually, the taste was so bland, I might as well have eaten the drawing I made earlier. With a smorgasbord of ingredients, (including an overload of veggies) you'd expect some semblance of taste. But there was none whatsoever. The only time I got a kick of flavor was when I bit into a large chunk of ginger, and I can tell you right now, it wasn't too pleasant. even the garlic bread was dry and hard. The only thing i can say about it was, the noodles were cooked well. I'm usually pretty optimistic when going to restaurants, and willing to give it another chance.. But my trip to Burgoo was just one disaster after another, I definitely won't be going back any time soon. with the prices, I expected a whole lot more. It's too expensive for what you get in return. In fact, after receiving the bill, I realized maybe Burger King really was the way to go. And my perception of Burgoo being a "Poor Mans TGI-Fridays"? After this experience, I can safely say it wasn't even a "Homeless Man's TGI-Fridays"! hey you never tried raspberry cheesecake yet! I agree. 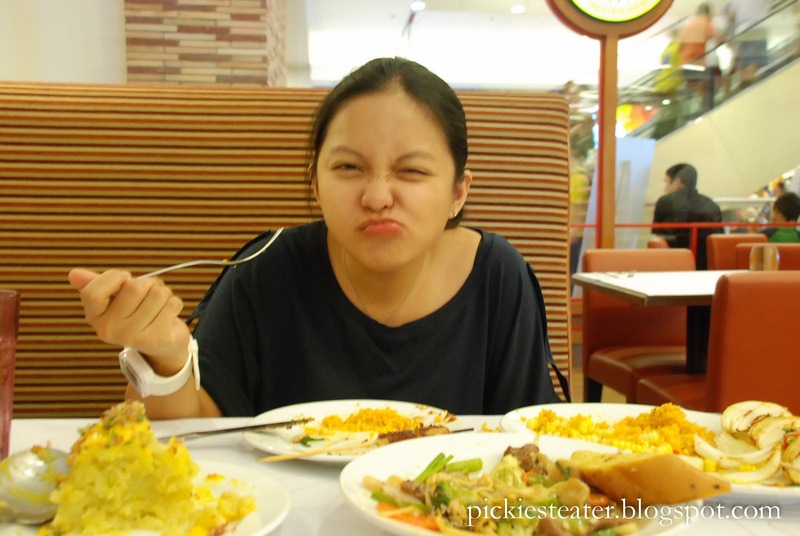 Burgoo is such a waste of money! I also agree. Most of the food is dry. 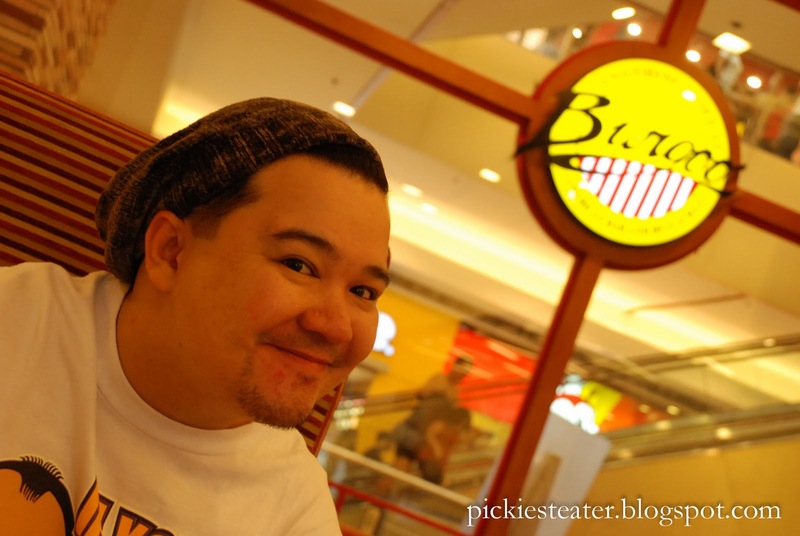 The only thing I'd return to Burgoo for is the marshmallow shake, and that gives me a massive sugar crash afterwards. The marshmallow shake sounds interesting, Carmela! I'd give that a try..
Oh and Rina's grimace? That's the same face she gave me the first time I tried a pick up line on her. After that I was a goner. I'll definitely check those places out! Awesome blog you've got, Roni! !